First, an update on Paul's First Socks -- I have turned the heel once again and am now an inch or two into the foot of the socks. I foresee the first sock being done in the next several days, if I'm lucky and his foot doesn't magically grow in size. I've also decided on the next sock yarn I'd buy for socks for Paul, but that'll be a while. As to the blanket which is not mine, Christy, a good friend of mine (and one of my bridesmaids from my wedding), was very kind and she knit Nathan a gorgeous blanket. 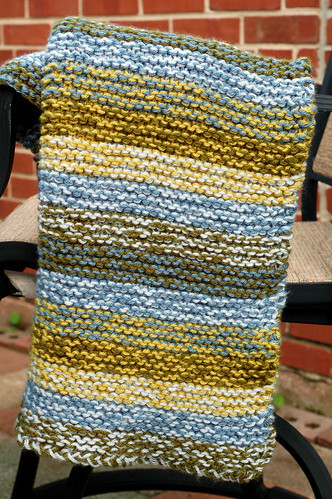 It's a garter stitch blanket, but done in stripes of two colors held together. I think the blanket is the Blue Lagoon pattern from Lion Brand, but I could be wrong. It's gorgeous and wisely done in blues and yellows. Perhaps Christy knew what gender of baby I was having before I did? I'm so happy that Nathan will have several handknit items such as blankets and socks. I'm also very surprised that Christy did a blanket since normally she knits hats for babies nowadays because blankets are too large a knitting commitment. Thank you, Christy! Now, as to my knitting plans, I hope to knit several things in the future. First off, I need to make socks for Helen. The socks are the Spiral Boot Socks from Interweave. You can buy the pattern at Interweave's website, though if I can find the whole magazine, I'll get it. In fact, I've bid on the magazine at Ebay recently because I love two or more of the patterns in it, which makes it a good buy. I also have plans to knit a Slytherin scarf for myself, which will be identical to Paul's Gryffindor scarf, but knit in Slytherin colors, because I am evil. Some of the scarves on Ravelry make me want to make this my first project, but I'll most likely make this project one that I work on in conjunction with other projects. The last two things I want to knit are a cute little hat from "The Yarn Girls' Guide to Simple Knits" which uses some GGH Soft Kid which I have stashed away in a pretty deep berry red, and a pair of socks for myself made from Koigu. After I've knit these four items (or the three non-scarf items), I might allow myself to purchase more yarn. I normally only knit on one project at a time, because I'm exceedingly boring like that, or focused anyway, but I plan to make some exceptions in the future. From now on, if I'm knitting on a boring project like a baby blanket or endless stockinette or garter stitch scarf, I plan to also knit on one other item such as a pair of socks or tank top or hat. I'll be moving from being a one WIP type of girl to a two WIPs type of girl. Hopefully this won't bring me to the end of my knitting dreams and hopes because I become too scattered and disorganized. You're a sweetie! And you're welcome.